What is Thanksgiving meal or Summer potluck without a jello side dish? Even though it is more of a dessert, it is still known as a salad. 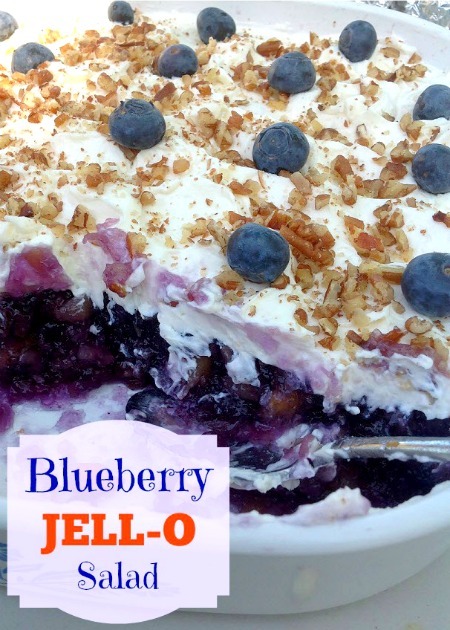 This blueberry JELL-O salad mixed with pineapple and blueberry pie filling is another delicious classic JELL-O dish from the 60’s that is especially popular in the southern states. You will find this dessert commonly served at holiday gatherings and special occasions. Even people that do not typically like Jell-O dishes love the texture of this dessert and ask for seconds! 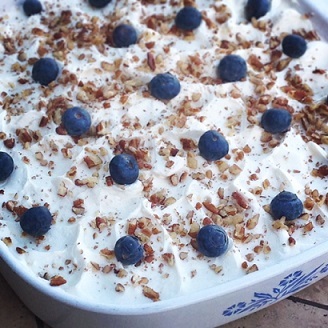 This wonderful Blueberry JELL-O Dessert Salad shared with us by family friend Kris Brennen of Portland, Oregon. * Raspberry or blackberry flavored gelatin can be substituted. * For a cherry version, substitute cherry flavored gelatin and cherry pie filling. ** Do not use fresh pineapple as it contains protein-splitting enzymes that will prevent the gelatin from setting. Drain the pineapple juice into a one (1) cup measuring cup. Fill the rest of the cup to the top with boiling water. Pour the liquid into a medium sized bowl. Add the gelatin into the pineapple juice/boiling water mixture and stir until the crystals are completely dissolved. Add crushed pineapple and blueberry pie filling. Stir to combine. Pour the gelatin mixture into a 9- by 13-inch pan. Cover and refrigerate until firmly set. The salad can be ready to serve in 2 to 3 hours or leave overnight. Keep chilled until ready to serve. Approximately 30 minutes before serving, spread with the prepared creamed cheese topping until covered evenly. Garnish with fresh blueberries and chopped nuts. Cover with plastic wrap and chill for another 30 minutes before serving. Store gelatin desserts in a covered container to avoid the formation of a thick rubbery skin on the surface. In large bowl, combine cream cheese, sugar, sour cream and vanilla extract. With electric mixer on medium speed. Whip together until smooth and creamy. Add more sugar to taste if needed. Cover with plastic wrap and set aside in refrigerator until the above Blueberry Jell-O mixture is set. The topping can also be made right before you are ready to serve the salad. The applesauce and 7-UP soda make this JELL-O a denser consistency. With the topping of the whipped cream mixture, it reminded my husband of Key Lime Pie flavors. We agreed it was just plain delicious and finished our plates! I have made this for years and it is very, very good! Is it ok to use fresh blueberries? 1/2 cup of fresh berries are stated in the recipes.